When asked to log in. The screen says you’re logged in but you still can not watch anything. Even when you have it in your cable package. The app won’t allow you to watch the latest episodes because you’re not signed in however, once you try to sign in it decided to tell you that you are now connected and only allows you to exit out of signing in. Doesn't carry Charter Spectrum anymore!?!? The mtv app is great. Episodes are uploaded right away which is that best part ! How does a media app not have a search function? I can’t type in the specific show. I have to scroll in the hopes that it’s there. This app is so annoying when it asked you to put your tv provider as in why do we have to do that like I download the app for a reason because I don’t have a Tv or a Tv provider so I strongly suggest that don’t get this app and plus they put new episodes like till the follow week the episode aired on tv so STRONGLY suggest NOT to download this APP. It’s extremely annoying how the live tv doesn’t cast to my chrome cast! Every other tv app does this!! Also it’s annoying that they never upload recent episodes the next day after they air!! You cannot watch full episodes without entering in your account information for your tv provider. I live in an apartment complex that provides the cable and internet to all of its units. I am not allowed to have the account information. Also, I assume a lot of people get on here to watch full episodes because they probably don’t have access to cable or satellite tv. Thus, the app is useless to people like me that aren’t allowed to have the account information or people that don’t have a tv provider. I understand the need to have advertisements and commercials but this app uses double the amount (if not more!) than any other cable station app I use. It’s annoying and makes the show not worth it. Every time my phone is connected to my Google Chromecast while I’m watching The Challenge: Vendettas, it keeps freezing on commercials and ads. I tried repeatedly pressing the pause and play button, but nothing helps. It really takes away the enjoyment from me watching my favorite show. I can tell you this app is so aggravating and time consuming. It stops working in mid stream and I don’t have the time in my busy schedule to start the app over every time it messes up!! Really upset and disappointed that this app is not functioning correctly. I only have 1 complaint. All your Unplugged’s should be on here. That Miley Cyrus one was SPECTACULAR. It’s such an annoying app to use, and I tried to put my cable provider in but they didn’t even have it. Keep in mind I have optimum. It amazes me that a media company could have an app that is this awful. The app is glitchy, freezes, doesn’t sync when trying to use airplay, repeats the same three commercials again and again. Of all the apps for television network I’ve used this is by far the worst. I would give it zero stars if possible. This app should’ve been available in all countries mostly the Caribbean and the west indies part i wanted to watch Wild ‘n out but i could the app told me Oh no it’s not available and i think that it’s a lack of importance not given to you subscribers. Really not professional! Its a great app definitely would recommend just there is a lot of adds. I think its pretty annoying that you cant see past seasons of the shows or shows that are not currently airing or past seasons of those shows. Please add past seasons for future shows , its really annoying. Fix the spectrum provider on your AppleTv and app. I have emailed for support with no response already. The app is very slow and never has all the shows and being up to date. If you do get your show to show up, it will lag and have quality issues. The app works perfectly and the shows are so amazing! Keep it up MTV! I use my Verizon login to access locked shows, but it never remembers me and always freezes. I can’t access and watch the shows I like. I uninstall and reinstall to see if it helps, but this is one of the worst TV apps ever. I’ve never written a review for an app but had to this time. This app needs so many bug fixes. This isn’t just one review here and there. Tons of people are reporting the same problems as me. First of all, it constantly stalls and tells me I have no internet connection when I definitely do. I constantly have to uninstall and reinstall the app because it will just go black. It takes me 2 hours just to watch one episode not to mention the millions of commercials. Very frustrating. The app is smooth and easy to use, let’s you sign in with your provider to get the all content unlocked. Why?! It worked just fine with my tv login just a couple weeks ago. Then, the app signs me out and all of a sudden I can’t login or it’s not included in my package when I know it is. It used to work on the website, but that doesn’t work either anymore. See. I said I would get the cookie cutter auto response saying - Email us for help! Here’s the thing. I ALREADY EMAILED YOU FOR HELP AND YOU NEVER RESPOND. So take your “email us for help” and shove it. This app is absolutely horrible. 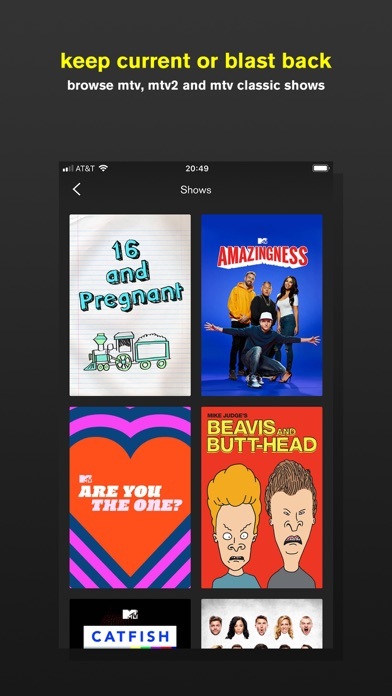 The episodes play in the wrong order, the descriptions and thumbnails give away information from the episodes before you watch them, shows (that are definitely on the app) don’t show up when searching for them, and now we can’t even watch anything at all because every time we start an episode it kicks us off. Waste of time getting this app. My husband thought I was exaggerating about how bad it was until he started watching the challenge with me. He is amazed at how terrible the app is and frustrated enough to quit using it. They don’t care about your problems or reviews. They all get a cookie cutter auto response that says - Email is for help! when the problems are ALL on their end and there’s nothing you can do to fix it. 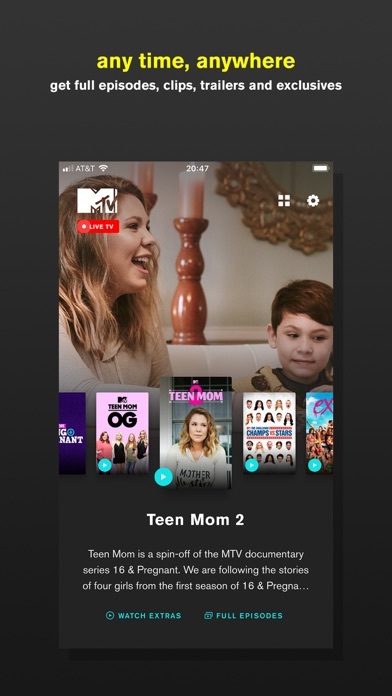 A big name like MTV should be ashamed to have their name on this app and they should promptly fire “their guy” and hire a six year old to help them with it. Ridiculous. I love that I can now watch MTV on my time. I can watch when I want. This app is horrible I’ve been trying to login in for a week it just keeps loading. How can you not have Comcast as a sign in option? Total BS. App is a waste of space on my phone, now. Why dont you have Xfinity as a Tv provider..
Why isn’t Xfinity, one of the largest TV providers in America, not on the list!!? Does that make any sense to you what so ever? I can’t watch any of my shows, and most of everything is locked, so this app is officially pointless. And when I do find a show that’s open, and connect it to my chromecast, it buffers about every 5 minuets and turns on to this blank-striped screen. I think we’re in an age now where apps aren’t supposed to have these many stupid problems, and yet big TV broadcasters like MTV has put mediocre apps as its standard. Do better. There’s no excuse. Tired of this app listing Xfinity as a TV Provider one minute, then not the next. When Xfinity is listed, I can log in and view any episodes with no limitation. Until I get prompted to login in again, if Xfinity is not listed, I can not log in, I can't view anything. It's super frustrating and it's been back and forth with this app for over a year. Xfinity is a major provider so I'm not sure the problem. I will delete this app from all my Apple devices as it's useless if I can not consistently log in. I have so many issues with playback with this app! I was just watching the challenge and had to pause it. I go back to press play and now it won’t even load! 🙄 There’s always something going wrong with this thing! I am writing this after wasting a half hour trying to get the app to work to watch a show I was watching with 0 issues last evening. The show would glitch and not play. Not frustrating at all.... Half the time I try to watch stuff on the app, it says I’m not connected to the internet despite clearly being connected to WiFi. It never logs episodes chronologically, and will randomly start playing unselected shows. I never write negative reviews and I’ve written 2 on this trash app because it continues to never work. I don’t know why I even bother anymore. Probably because I pay for it. I’ve had the app now for 2 months and cannot use it due to them not having my cable provider, every time I try to log in it says they are working on getting it. I’ve even tried to send them an email! I’d like to leave a better review but on my iPhone it defaults to a sign in option that I no longer have available (with no option to change to a different provider) and on my iPad the sign in link doesn’t work. i can’t watch a show i have to constantly close and open the app in order to have sound and all my other apps that i can watch shows on work perfectly with the sound. so idk what’s going on and sometimes commercials are louder than others when the volume is low. worst app ever. I downloaded he app and in order to unlock full episodes I have to sign into my cable provider. My provider is not listed even when using the search feature. The app does me no good without being able to watch the full episodes. I have AT&T as a network provider. MTV is included in my TV package. The MTV app will not allow me to login, and I am prompted to contact my cable provider to add a package that includes MTV. MY CABLE PACKAGE INCLUDES MTV, MTV2, AND MTV JAMS. THERE IS NO SHORTAGE OF MTV IN MY CHOSEN PACKAGE. What a joke of a streaming app. If I could give negative stars I would. This app doesn’t support our internet access xfinity by Comcast. Now I can’t use app at all and the message reads for me to be patient? Sure! 90% of the time the app is so slow (regardless of how strong my Wi-Fi or cellular connection is) that I can't play any episodes anyway. The 10% of the time it does cooperate, it signs me out of my TV provider every time I close the app. Then usually when I open it again, it's back to being too slow to even let me login to my provider. Love the app , buuuut episodes that you play skips to a completely different part of the show so you’re never really able to finish a show. The amount of commercials are ridiculous. There are far many more commercials than on live tv. The only good reviews this app has is probably the app programmers. Plain and simple. This app literally just doesn't work. We love MTV but we hate you. Oh yeah and I say.... TRASH. It would be nice to use the app. The app doesn’t list my tv provider and my tv provider is popular in my area and have used it for other apps. I’m disappointed I can’t use the app. I hate this app for so many reasons- mostly because they show the same the commercials a million times and every 3 mins. 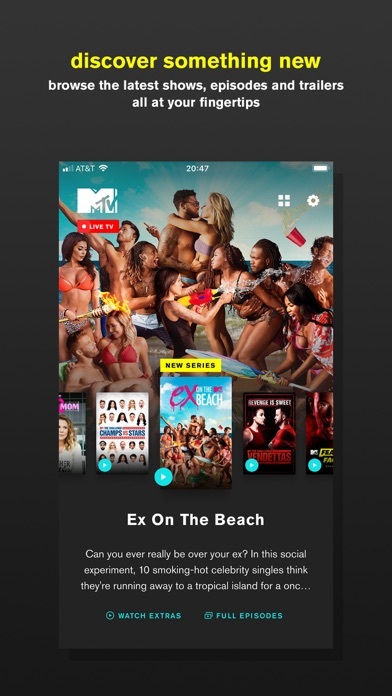 How does MTV have such a horrible app?? The app works fine. Does not have Comcast xfinity as a tv provider so it’s useless to me to watch full episodes. The MTV app used to allow me to watch shows without the need to login to a tv subscription but now I need too. I don’t have a tv subscription I have basic cable I recently missed an episode of AYTO a show I really like and I can’t watch it cause I don’t have a tv provider subscription. The app really needs to get rid of that so I don’t have to worry if I miss an episode. It’s really frustrating and makes me mad. Worst App Ever - Freezes after opening commercial. Playing on iPad thru appletv - episode starts with a commercial and then just stops at end of commercial - all the app will let you do is replay the commercial - when you exit the app and go back in the app just shows one commercial and stops again. I stopped watching MTV due to this app. I use HBO, Showtime, Netflix, TNT, USA, and FX apps and never have had an issue. MTV should fire the developer. Great app. No lag. Only issue is why are the commercials so loud? Even from the music played on shows or in the intros, the commercials are so much louder. It’s disruptive and should be corrected. I would like to start out by saying this app WAS really good for a while, I truly enjoyed it, until I began noticing spotty episode placement as well as the COMPLETE LACK of certain episodes!!! That’s sooo disappointing! 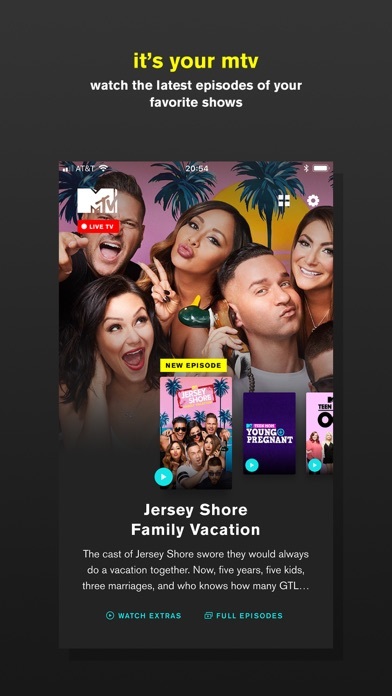 I was catching up on Jersey Shore Family Vacation (the best show MTV is running currently IMO 😅) and finally got halfway through season 2, and noticed episodes 15-20 are completely missing from the app!! What’s up with that??? So now I’m stuck without those episodes and I’m not jumping from halfway through the season to the very end! I know it’s a first world problem, but that is bs! Would love to see those episodes included on the app, then you would see a five star review from me. I’m not hard to please, I just like things to work as promised! If you were expecting to actually look up shows think again. You have to watch 4 ads just to get to watch your show which is ridiculous. THE WORST PART is that each and every time you stop your video and then come back to it YOU HAVE TO WATCH 4 ADS AGAIN!! Let me not forget to tell you that it will kick you out of the app several times and won't let you back in. ZERO STARS IF I COULD. You guys obviously haven't done work on this app at all and if you have you need to try HARDER!! The app worked great at first. Then, after commercial break, the episodes would cut out to a completely different show. Now, nothing will play for me at all anymore. MTV - STOP TELLING ME TO EMAIL YOU!!! I HAVE SEVERAL TIMES AND YOU NEVER ANSWER. YOU ARE LIARS AND OBVIOUSLY IDIOTS. YOU DON’T CARE ABOUT THE PEOPLE LEAVING THESE REVIEWS. SO JUST STOP. Just an update from my last review months ago... this app is still absolutely terrible. Most of the time you can’t even watch an episode because you get kicked off as soon as you hit play. If you do get to watch the episode you will get kicked off at the end of it. Emailed mtv again with the cookie cutter response email they give with still no response. They don’t care. See. I said I would get the cookie cutter auto response saying - Email us for help! Here’s the thing. I ALREADY EMAILED YOU FOR HELP AND YOU NEVER RESPOND. So take your “email us for help” and shove it. This app is absolutely horrible. The episodes play in the wrong order, the descriptions and thumbnails give away information from the episodes before you watch them, shows (that are definitely on the app) don’t show up when searching for them, and now we can’t even watch anything at all because every time we start an episode it kicks us off. Waste of time getting this app. My husband thought I was exaggerating about how bad it was until he started watching the challenge with me. He is amazed at how terrible the app is and frustrated enough to quit using it. They don’t care about your problems or reviews. They all get a cookie cutter auto response that says - Email is for help! when the problems are ALL on their end and there’s nothing you can do to fix it. A big name like MTV should be ashamed to have their name on this app and they should promptly fire “their guy” and hire a six year old to help them with it. Ridiculous. I downloaded this app because I wanted to watch shows like Teen Wolf, Faking It, etc. But none of those are there! Please add more shows! ***MTV SHOULD JUST ALLOW HULU TO PLAY THEIR CONTENT AND CALL IT A DAY! !”*** This App is the worst. Especially if you are using it on the Fire Stick. So slow, I expected more from MTV. The developers need to get their ish together. -too many ads; the amount of ads is obscene. Why am I watching ads? I have a cable log-in. -poor playback, freezes constantly -have to restart my firestick bc the app freezes. -always puts the captions on and i have to turn them off. Annoying. -doesn’t play episodes in order. Skips all over the place. COME ON MTV. Get it together!! I’ve been watching shows for years with this app using my DirectTV login. Within the last week it’s stopped working and is only allowing me to login to watch with SuddenLink. I don’t have SuddenLink, I have DirectTV. Very upset. I am so over the ”we’ll be right back” commercial breaks. They get stuck in a continuous loop and you have to leave the app to reset it. Super frustrating. I am beyond frustrated with the app. I use to love watching the shows on the app, but now it constantly crashes in the middle of an episode or five minutes after I have started watching. When I start it back up of course I have to watch all the commercials again. I even deleted the app and redownloaded it and this crap still is crashing. I wish I could rate this zero stars. This app NEVER plays the correct show on what is supposed to be the “live tv” option. At 7pm on Wednesday’s, Are You the One comes on so I try to watch it live but EVERY SINGLE TIME Catfish is playing and doesn’t change to AYTO. It will even say “On Now” and under it will be AYTO but Catfish is still live. This needs to be fixed asap. I can't even use the app because every time I try and watch something it plays 50 thousand adds.. then the actual show starts that I wanted to play then the app randomly just closes out! Re open the app and go through the same thing over and over again can't even use the stupid app at this point. Tried re downloading the app several times and it always does the same thing and it's not a problem with my phone ethier because this doesn't happen with anything else on my phone. Not worth it to download this app.. just watch it online instead. This app glitches and forces close a lot. You end up watching double the ads because it will force close on you then bring you back to ads (which you just watched) before it allows you to finish. Sometimes the video player still doesn't work after the ads and it forces close again. So tired of how the app automatically starts playing an episode when a series is clicked on. Using this on my iPad and there’s no option to exit an episode when it starts automatically playing unless I rotate my screen. There are way too many ads every 3-5 minutes. I would rather pay for the app than watch ads. Please take into consideration to change the amount of ads. This app needs to allow live casting from phone to tv. I can’t stream live tv from my iPhone to my tv using my google chromecast. Once this feature is added, I can give you 🖐🏽 stars 😁.